The term ‘tune-up’ was coined when Henry Ford was working on his first automobile prototype. This first ignition system was very simple; one ignition coil for one spark plug, so four spark plugs would require four ignition coils. Vehicles and diagnostics have come a long way since then. If you’re searching for state-of-the-art, efficient, and speedy auto repair, Joe Davis AutoSport in Perkasie, PA has exactly what you need. Our close relationship with top-of-the-line parts suppliers leads to quick turnaround for our customers, who trust us to treat their car like a member of the family. While we specialize in European auto repair for makes like Audi, Saab, Volkswagen, and Volvo, our team is expertly trained and ASE certified to repair and maintain all makes and models. We offer a 24 month/24,000 mile warranty on all repairs, so you can pick up your car with the confidence that we’ll meet your needs no matter what. 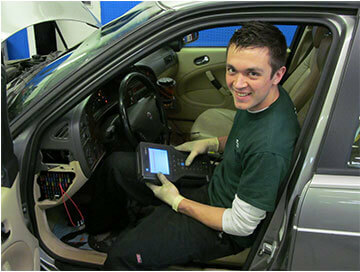 We also have state-of-the-art diagnostic equipment, so you rest assured that we will find out what’s going on with your car and fix it immediately. And while we’re working on your vehicle, you can relax in our comfortable waiting room and use our free Wifi. And since we know how busy our client’s lives are, we’re happy to offer free shuttle service and loaner cars to our Perkasie auto repair customers. It is the mission of Joe Davis AutoSport to provide extraordinary service to our customers, a safe and enjoyable workplace for our employees, and an ethical environment that creates opportunity for all!